Frescolina ricotta salata cheese has been tied to an outbreak of listeria that has hospitalized 14 people and killed 3. At least three people are dead among 14 people sickened in 11 states by an outbreak of listeria food poisoning linked to contaminated ricotta salata cheese, health officials said late Tuesday. All of the victims have been hospitalized. One lot of Frescolina brand ricotta salata cheese, imported by Forever Cheese Inc. of Long Island, N.Y., has been recalled in connection with the outbreak, according to a report posted by the federal Food and Drug Administration. The company pulled 800 wheels of ricotta salata, or roughly 4,800 pounds, on Monday. Whole Foods Markets said late Wednesday that it is recalling Forever Cheese Inc. ricotta salata from stores in 21 states and Washington, D.C., because of the potential contamination. Ricotta salata is a salty white cheese made from pasteurized sheep’s milk. It is often served crumbled or grated as an ingredient in salads, pastas and other dishes. It is not the same as ricotta cheese, a very soft cheese sold in plastic tubs and used for dishes such as lasagna. The cheese was sold to distributors for retail stores and restaurants in 18 states and the District of Columbia between June 20 and Aug. 9. Because the cheese may remain in home refrigerators, consumers should check for the product and discard it. The recall affects lot number T9425 and/or production code 441202. Illnesses connected to the outbreak were diagnosed from March 28 through Aug. 30, CDC officials said. Four of the illnesses were related to pregnancy; two were diagnosed in newborns. The other 10 people infected ranged in age from 56 to 87. Officials are still investigating the connection between the March illness and the cheese sold later to stores and restaurants. The deaths tied to the tainted cheese were reported in Minnesota, Nebraska and New York. Listeria was confirmed to have contributed to at least one of the deaths, the CDC said. It's not yet clear whether the other deaths were caused by listeria, or whether those patients infected with the outbreak strain of the bacteria also had other health problems primarily responsible for their demise. The cheese was sold in California, Colorado, Florida, Georgia, Illinois, Indiana, Maine, Maryland, Massachusetts, Montana, New Jersey, New Mexico, New York, Ohio, Oregon, Pennsylvania, Virginia and Washington. The cheese is made by Fattorie Chiarappa Srl of Conversano, Italy, and imported by Forever Cheese Inc. said Denise Clarke, a spokeswoman for the importer. The cheese is imported as whole wheels packaged in Cryovac and then is distributed in the original packaging to wholesale distributors and retail customers such as supermarkets and specialty retail food stores, Clarke added. 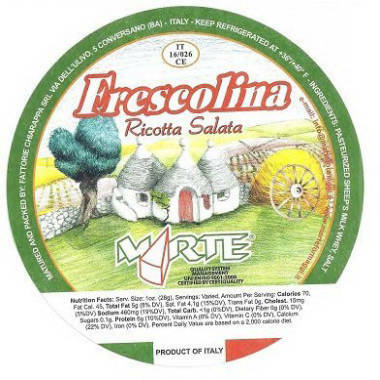 FDA officials identified the outbreak strain of listeria monocytogenes bacteria in a sample of uncut imported Frescolina brand ricotta salata cheese. Federal agencies are working with the firm and with health authorities to make sure the products are removed from market. Listeriosis is a potentially life-threatening infection that is particularly dangerous to pregnant women, people with weakened immune systems and the elderly. Symptoms include fever and muscle aches as well as diarrhea and other gastrointestinal distress. Pregnant women may experience a mild, flu-like illness, but infection during pregnancy can lead to miscarriage, stillbirth, premature delivery or life-threatening infections in newborns.